Sneakers Sports Grille has won the loyalty of sports fans and many others by delivering great food, great service in a fun sports atmosphere. Sneakers Sports Grille has a long history of giving more than just game viewing experiences by hosting live TV shows (currently hosting “The Mark Brunell Show” on Monday Nights) as well as many National and local events. Keep up with all the action on Sneakers Sports Grille’s 8 towering TV’s, in booth TVs and tons large flat screen TVs thoughout. What better way to track your fantasy football teams status or watch your favorite college teams while you enjoy time with friends and family. LET’S TALK FOOTBALL LIKE PROS ON MONDAY NIGHT! The Mark Brunell Show on CW17 is broadcast live from Sneakers Sports Grille every Monday night. Mark Brunell is joined by Cole Pepper and Nikki Kimbleton for an inside look at Jacksonville’s NFL team. Mark and the team recap the previous game, preview what’s to come and have a little fun. 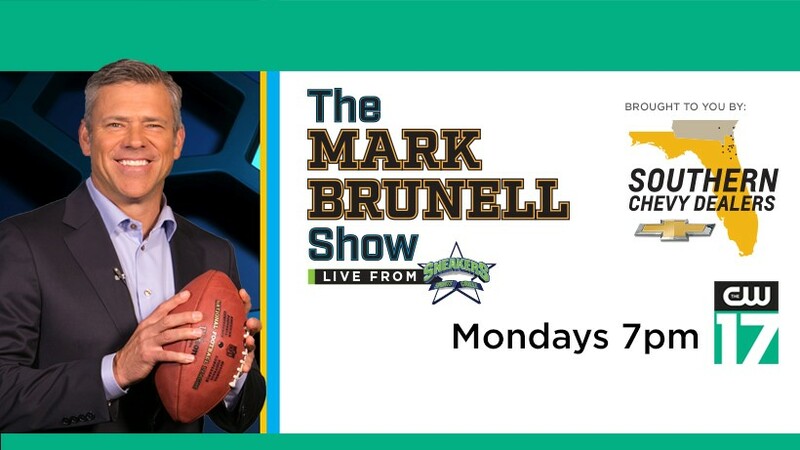 Audience participation includes The Mark Brunell Show team answering selected questions and competitions with Mark Brunell. Even better the guest table that is the most jagged out and shows the most spirit will have their check picked up by The Mark Brunell Show Team. Come for the show, stay for Monday Night Football. You already have the best seat in the house! For best chance to win please subit your completed entry form by the friday before the show you wish to attend.